Since my first post on fifth generation (5G) mobile networks, in August 2013, there has been a dramatic upsurge in activity and publicity on the topic. Leading organisations in the mobile industry have become increasingly vocal, in white papers, conferences and press releases, about the benefits of 5G, the technologies they expect to feature and the early results of their research. On the downside, this has led to a bewildering array of ideas, some of which are still unproven and most of which require substantial further development. Nevertheless, amid the complexity and confusion some common themes are emerging. 5G networks are aimed at meeting the requirements for mobile communications beyond 2020. Supporting the inexorable rise in mobile data consumption is an obvious objective. However, there are many other challenges, including the need to support a proliferation of devices, vast numbers of machine-type transactions, ultra-low latency, deep coverage, ever-more efficient use of the scarce radio spectrum, minimal energy consumption and robust security across a wide variety of operating environments and technologies. The diversity of technical and commercial requirements for 5G will require greater flexibility than ever before. novel techniques for radio resource control, antennas, protocols and architecture, to improve spectrum utilisation, reduce latency and increase flexibility. The figure below provides a snapshot of some of the network requirements to be addressed over the next 10 years, alongside some of the developments that are likely to feature as 4G networks evolve into 5G. An unmistakable objective for 5G networks is to support the escalation in mobile data consumption, with users craving higher data speeds and traffic volumes expected to increase by hundreds or even thousands of times over the next ten years. It is likely that 5G networks will have to deliver baseline data speeds of 100Mbit/s and peak speeds of up to 10Gbit/s. Not only will there be a need to cope with the total volume of traffic, but the concentration of traffic in some locations, such as business districts and commuter hubs, will require new approaches. With wireless technologies already approaching the Shannon limit for bits/Hz on individual radio links, the focus must turn to packing in more base stations in a given area, to achieve substantial increases in bits/Hz/km2. A further challenge for 5G networks will be a dramatic increase in the number of devices to be supported. Mobile networks will no longer be concerned primarily with person-to-person communications, as billions of new devices for remote sensing, telemetry and control applications lead to vast numbers of machine-to-machine and person-to-machine interactions, as part of the Internet of Things (IoT). Many of these devices will be simple, low-energy apparatus and in some cases they may be located in remote locations or deep inside buildings. While the volume of data involved in each transaction may not be large, the sheer number of devices and transactions will require new approaches, to achieve reliable, efficient and secure communication without compromising the efficiency of other aspects of 5G networks. LTE-Advanced networks can already achieve much lower latency than previous mobile systems, in principle less than 20ms, but developments in gaming, automation and remote control, including real-time interactions over the “tactile Internet”, will require even lower delays, in the region of 1ms. While the headline targets for throughput, capacity and latency are daunting in their own right, they tell only part of the story. A further challenge will be the breadth of requirements across different applications and devices and the need to satisfy all of these efficiently (in terms of both spectrum and energy consumption) and securely. Fast real-time data transmission may be required by some devices in some locations at certain times of day, but the same devices may have much more modest needs for data throughput or latency in other places and at other times. Some devices, such as those involved in remote monitoring or telemetry, may require quite low levels of data transmission and they may be tolerant to large delays, but there will be millions of these devices to be served in any given network and in some cases their locations may create coverage challenges. Between the extremes there will be a myriad of variations. Not only will there be diverse service requirements, but 5G network deployments are unlikely to be uniform across their coverage area. Different technologies, spectrum and architectures will be deployed in different locations, according to the local technical and commercial requirements and the evolution path from legacy equipment. The 5G system must be able to respond dynamically to the requirements of specific devices and applications, applying whichever technologies and spectrum are most suitable and sharing resources with other networks where appropriate. This has implications for the overall architectural design of 5G, as well as the individual technologies and techniques used to deliver services. 5G networks are expected to incorporate the capabilities of existing wireless technologies, including 4G LTE-Advanced, HSPA+ and WiFi, supplemented with one or more new technologies to address specific requirements. Between 2015 and 2020, the already substantial capabilities of LTE will be extended by deploying it in new frequency bands, applying existing and new LTE-Advanced enhancements and improving its integration with WiFi. However, this will not be enough on its own and new approaches will be needed to meet some of the most challenging requirements. 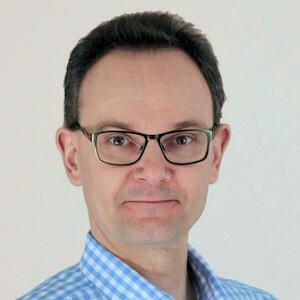 For example, the consumption of large volumes of data in concentrated areas will require the deployment of unprecedented densities of base stations, and the ultra-low latency needed by some interactive applications and games will require fundamental changes to resource allocation strategies, which could not easily be achieved by modifications to LTE. Instead it is likely that these requirements will be met by one or more new technologies, likely to operate in new spectrum above 6GHz and applying new radio techniques, architecture and signalling protocols. As the demands on mobile communication networks increase, the acquisition and efficient use of spectrum will become more important than ever. Satisfying the forthcoming demands will involve better use of the spectrum that is already available to mobile networks, access to additional bandwidth at similar frequencies and the exploitation of higher frequencies in the centimetre-wave and millimetre-wave bands. Historically, licences for operating mobile networks have been dedicated to individual network operators and in many cases they have specified which technologies must be used in which bands. However, regulators are now critically aware of the need to maximise the utilisation of valuable radio resources. Spectrum neutrality and spectrum sharing are major trends that will continue as we move towards 5G. Many regulators have already relaxed their constraints on how spectrum is used in particular bands, and this will continue, to allow mobile network operators to utilise the latest, most efficient technologies in their spectrum allocations. As users and network operators upgrade their devices and equipment, network operators will take the opportunity to re-farm their spectrum to allow the use of the latest LTE-Advanced capabilities. It is most likely that 5G networks will continue to rely on core spectrum that is reserved for the use of individual network operators, to protect them against interference and enable them to achieve predictable and reliable levels of performance. However, it is also likely that this core spectrum will be supplemented with shared spectrum and unregulated spectrum to bolster capacity and throughput at particular locations and times. Dynamic sharing of spectrum, with careful protection of the rights of each network, will improve the efficiency of spectrum utilisation, for example allowing network operators to share wide bandwidths, to provide good quality of service to individual users, while achieving efficient spectrum utilisation if the number of users is small. This is preferable to allocating all operators a small bandwidth (which would limit throughput) or allocating spectrum to just one network operator (which would limit competition and may result in under-utilised spectrum). Until now, most mobile systems have been deployed in a spectrum “sweet spot” from a little under 1GHz to a little over 2GHz, for example exploiting bands at 900MHz, 1800MHz, 1900MHz and 2100MHz. Frequencies in this range propagate well (over reasonable distances and through walls and other obstructions) and their wavelengths are such that antennas can be made with dimensions that fit within a typical mobile device. In contrast, higher frequencies propagate less well and lower frequencies require larger antennas. high frequencies, from 6GHz to tens of GHz, for high capacity in areas of dense usage e.g. in campuses and transport hubs. In many markets, mobile networks have already benefitted from a “digital dividend” by migrating television broadcasting from analogue to digital transmission, to release UHF spectrum around 700/800MHz. It is likely that on-going rationalisation of broadcast services will release further spectrum in this region over the next few years. The attractive propagation characteristics of these frequencies makes them ideal for delivering coverage to rural areas and for achieving coverage deep inside buildings. Public mobile networks have always relied on exclusive access to licensed spectrum as a means of controlling interference levels and achieving predicable levels of performance. Licensed spectrum will continue to provide the backbone of 5G networks. However, there are large blocks of unlicensed spectrum at attractive frequencies, for example at 5GHz, which mobile networks could exploit using either WiFi or LTE-Advanced. One possibility is that networks use licensed spectrum for robust wide-area connections, for example to carry control signalling, supported by dynamic access to unlicensed spectrum to bolster data transmission. Even when combined with the enhanced capabilities of LTE-Advanced this additional spectrum will not be enough to satisfy the most intense data communication requirements. For example, delivering all of the mobile data required in dense urban areas is likely to need a move into the high-frequency end of the centimetre wave band (somewhere between 6GHz and 30GHz) or the low-frequency end of the millimetre wave band (somewhere between 30GHz and 100GHz). These bands offer the prospect of vast capacity, but they suffer from poor propagation characteristics and therefore rely on small cell size and advanced antenna techniques (discussed below). The spectrum used by mobile systems around the world is already fragmented and the introduction of new bands and new operating modes could make matters worse. The success of GSM and then UMTS was built on a relatively well-contained set of frequencies for deployment, which limited the number of variants required for equipment manufacturers to support a worldwide market and for network operators to support roaming. Fragmentation of spectrum allocation could result in mobile devices that are incompatible between markets, or have different capabilities between markets, and could jeopardise economies of scale. The consequences of fragmentation can already be seen in the implementation of carrier aggregation in LTE, where each combination of frequency bands has to be addressed separately in the standards and leads to the piecemeal introduction of new capabilities. As the frequencies used by mobile networks are extended it will be crucial to develop a harmonised framework for spectrum usage. This will be a major focus for forthcoming meetings of the World Radiocommunication Conference (WRC) in 2015 and towards the end of the decade. Meeting the targets for 5G networks will require various new techniques to exploit the full potential of existing and new wireless technologies. There are diverse views on what might be needed. However, certain approaches are already appearing in the context of 4G systems and are likely to evolve into 5G over the coming years. As discussed in my previous post on the evolution of LTE-Advanced carrier aggregation, LTE includes the facility to combine disparate LTE carriers, which may or may not be in the same frequency band, to increase the peak user data rate and capacity of a network and to make the most of fragmented spectrum allocations. Early implementations of carrier aggregation support only a small number of component carriers and limited combinations of frequency bands. Over the coming years there will be increases to the number of component carriers, the maximum bandwidth and the band combinations supported. Ultimately the aim is to support up to five LTE carriers, each up to 20MHz bandwidth. There will also be new applications of carrier aggregation, for example between macro cells and small cells in heterogeneous networks (HetNets), between licensed and unlicensed spectrum, and between FDD and TDD spectrum. A characteristic of the Orthogonal Frequency Domain Multiple Access (OFDMA) method used to share radio resources in LTE is that all frequencies of the operating bandwidth are available in every cell all of the time. This creates both problems and opportunities, which become increasingly important as cellular architectures mix and match different sizes, shapes, layers and roles of cells and cells become more closely packed. Coordination of radio resource usage in adjacent cells can be used to mitigate interference and improve performance. If adjacent cells use the same frequency at the same time then a mobile device operating near the boundary between those cells may experience interference. Basic LTE defines a number of options for mitigating this problem with the Inter-Cell Interference Coordination (ICIC) feature introduced in 3GPP Release 8. The general approach is for adjacent cells to use transmission times, frequencies and power levels in such a way as to avoid interfering with each other on traffic channels used by mobile devices located near the cell border. LTE-Advanced extends this approach in 3GPP Release 10 with enhanced ICIC (eICIC), which applies the same principles to control channels and provides more sophisticated coordination of the radio resources to suit the needs of heterogeneous networks, where there is likely to be a mixture of overlapping large and small cells. Advanced interference coordination of this sort is not yet widely deployed and there is ample scope for further developments in this area to cope with cells being packed more and more closely together. A further example of coordinating the operation of adjacent cells is the Coordinated Multipoint (CoMP) feature of LTE-Advanced, which turns the OFDMA scheme to advantage by deliberately sending and receiving data between a mobile device and multiple LTE-Advanced base stations. A number of schemes are defined, which enable an LTE-Advanced system to make dynamic adjustments to the radio links available to a mobile device, in order to improve performance and network utilisation. This is another area with ample scope for further enhancements as 4G technologies evolve into the 5G system. As mobile networks develop over the next few years they will increasingly move to layered structures, in which different cells may have different roles, sizes, spectrum or technologies. The cellular architecture will evolve to provide much more fluid control and collaboration between the layers and cells of the network. In a previous post I introduced the concept of enhanced small cells (also commonly referred to as “macro-assisted small cells”, “phantom cells” and “soft cells”) in which macro cells provide a robust wide-area signalling connection for control purposes and small cells provide high performance data communication within their coverage areas. In future network architectures there will be many interplays of this sort, for example between cells of different sizes, between licensed and unlicensed spectrum, between Frequency Division Duplex (FDD) and Time Division Duplex (TDD) connections, and between LTE-Advanced and WiFi. Operating mobile networks in higher frequency spectrum in the centimetre and millimetre wavebands creates new challenges for radio designers, including the inferior propagation caused by increased path loss and greater dispersion compared with lower frequencies. However, it also brings certain advantages. The shorter wavelengths at these frequencies make it much easier to make large antenna arrays with relatively small dimensions, to be used at base stations or mobile devices (or both). In a previous post on LTE MIMO theory and practice I explained that LTE already uses Multiple Input Multiple Output (MIMO) antennas to improve performance. 3GPP Release 11 allows for up to 8×8 MIMO (i.e. 8 transmit and 8 receive antenna elements) in the LTE downlink, although this is unlikely to be implemented commercially for some time. However, a number of organisations are investigating much larger MIMO arrays (sometime referred to as massive MIMO) with 64 elements or more. In principle, high-order MIMO arrays of this sort could be used for beamforming (i.e. highly directional narrow beams, to reduce interference and increase performance) and/or spatial multiplexing (i.e. exploiting the independence of multipath components to increase the capacity and/or robustness of radio paths between mobile devices and network). Advanced antenna techniques of this sort will be essential if operation at tens of GHz is to be viable. It will never be feasible to provide wide area coverage at these frequencies, but in conjunction with high-order MIMO these frequencies could be used at the heart of dense urban networks, where capacity rather than coverage is the limiting factor. Achieving latency as low as 1ms requires new approaches to the allocation of shared radio resources. The problem can be addressed to some extent by transmitting very high speed data bursts using a wide bandwidth over a short period of time. However, there is also a need to take another look at the way shared resources are allocated to users and some organisations are investigating new approaches to Medium Access Control (MAC) protocols, to provide much more immediate access to resources than previous systems. 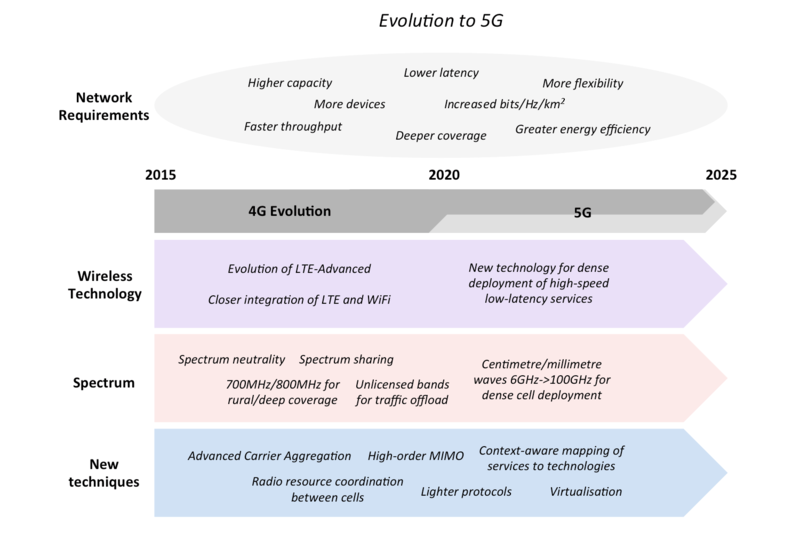 Advances in individual technologies and techniques will help to address isolated technical targets for 5G. However, 5G is not just about capacity, data rate and latency. It is also about extreme flexibility, to deliver a wide variety of services across a range of environments using disparate technologies in a highly efficient, robust and cost effective way. Achieving the levels of flexibility, agility and efficiency needed by future mobile networks will depend on new architectural approaches, including context-awareness and virtualisation. 5G networks will require context-aware mapping of services to technologies, to take an holistic view of the services required in a particular area and the technologies available to deliver them. The network will make dynamic decisions on which resources to use to deliver each service, so as to achieve the necessary quality of service in the most efficient way possible. Virtualisation builds on concepts already seen in cloud computing, whereby the services and capabilities offered by a system are decoupled from the underlying infrastructure that delivers them. In principle this could allow network operators to sell network capabilities, such as capacity, coverage and quality of service, rather than particular types of network access, and to mix and match the technologies used to deliver those capabilities in different environments. It could also enable network operators to expand and enhance the capabilities of their networks in a flexible way, by introducing new or enhanced technologies within an existing framework. Virtualisation relies on new approaches to network architectures and much greater software control of these architectures. Early examples of work in this area are Software-Defined Networking (SDN) and Network Function Virtualisation (NFV) and we are likely to hear much more about these concepts over the next few years. Given the critical importance of mobile communications it will be crucial for 5G networks to arrive on time, to take-up the expected demand after 2020. This will be no small task, given the size of the challenge, the complexity of the solution and the diversity of current proposals. There will be a need for strong management of the global spectrum framework, starting at WRC 2015, and international standardisation, expected to start in 2016, to keep the project on track.